The index opened weak around 7800 but saw good buying at lower levels to move back in green but closed just a few points lower at 7848.85, loss of 38.95 points. The broader market was weak with 601 advances to 939 declines. Range for the series is at 7600-8100. 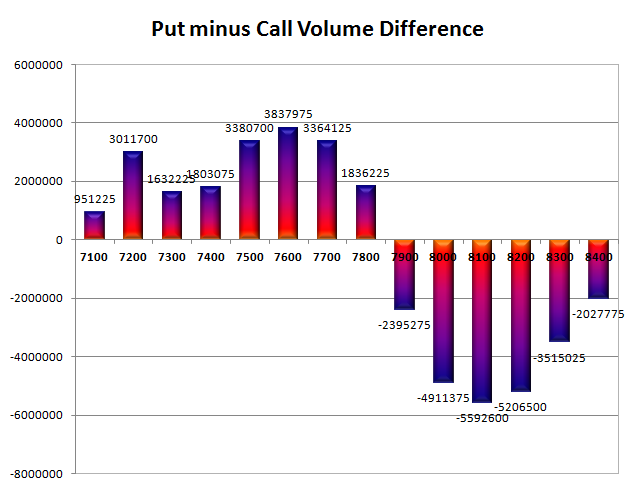 Call option 7900-8000, 8200-8400 added 7.04 lacs OI with profit booking at 8100 strike price. 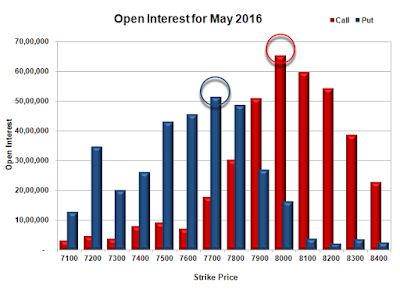 Put option 7800, 7400, 7200-7100 added 8.80 lacs OI with short covering at 7900 and above strike prices. 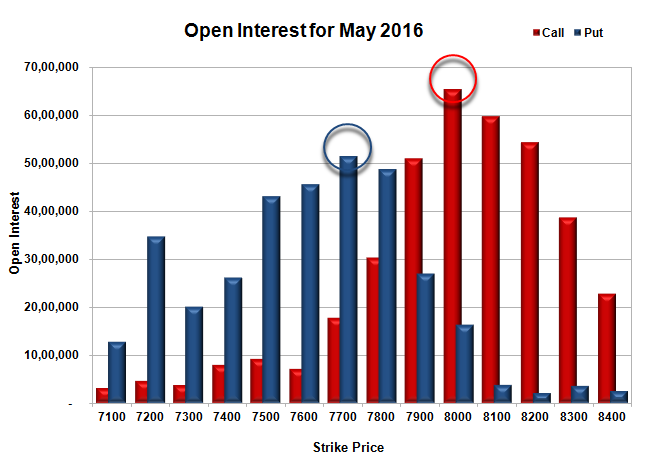 Nifty Open Interest is at 1,67,20,350 down by 17,63,100, with decrease in price, most probably long liquidation. 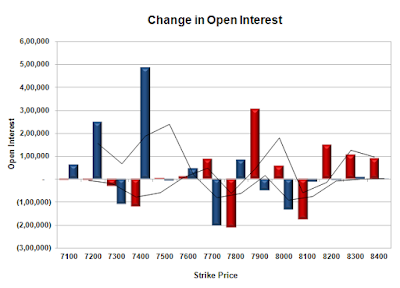 Bank Nifty Open Interest is at 16,57,620 down by 22,020, with decrease in price, most probably long liquidation. FII’s sold 16260 contracts of Index Futures, which includes net 12407 contracts long liquidation and 3853 contracts short build-up, with decrease in net OI by 8554 contracts, includes 21325 longs to 37585 shorts for the day. FII’s Index future open contract as on date is 134118 Longs to 98876 Shorts, Net 35242 down by 16260 contracts. 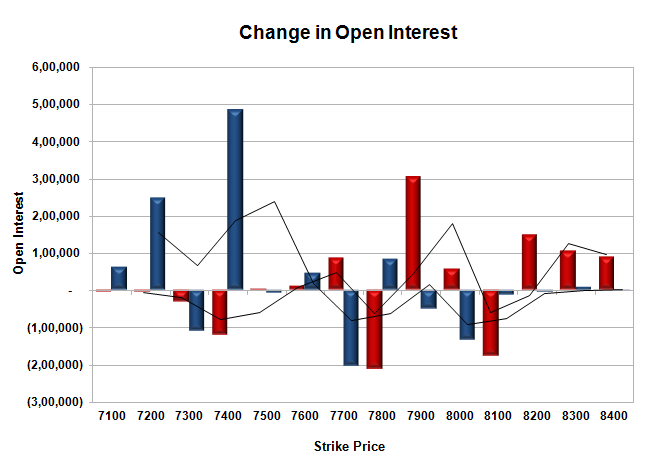 Initial support stays at 7800, with OI of 48.69 lacs and below that at 7700 with OI of 51.47 lacs. Initial resistance at 7900, with OI of 51.04 lacs and above that at 8000 with highest OI of 65.44 lacs. 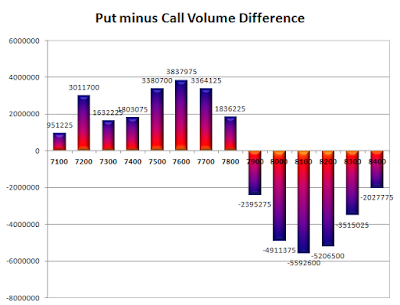 Day Range as per Option Table is 7775 - 7911 and as per VIX is 7779 - 7919 with 7841 as the Pivot.